EASTLEIGH teenager Connor Benzey pocketed more than £400 prize money after winning a high-quality junior tournament in Malta. 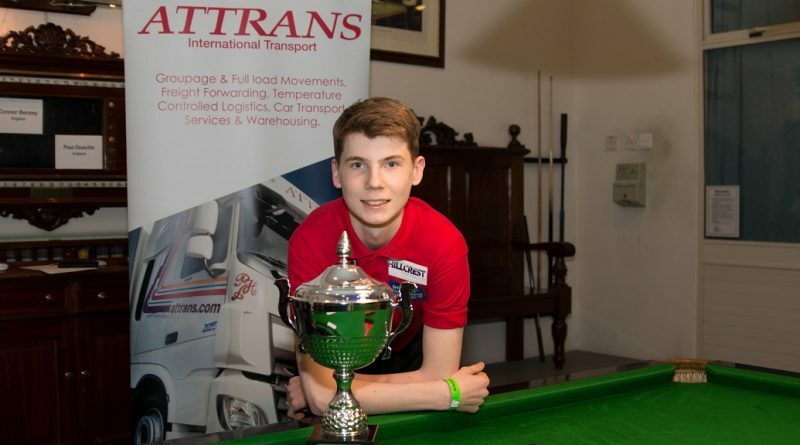 The 16-year-old defeated English Under-14 Champion Paul Deaville 5-4 in the final of the European Under-17 Snooker Open. It was a remarkable match that lasted more than four hours and swung violently in both directions as neither player was willing to concede defeat. Benzey’s dad Mark, a former Southampton Town Champion, was in the snooker room at the Peace Band Club, Naxxar. He said: “Watching one of my sons play at this kind of level with the poise and skill of a seasoned veteran will live with me forever. “The pride and satisfaction I felt standing at the back of the room watching everybody watching my son perform on this stage bought a tear to my eye. Deaville, 14, took the opening frame. Benzey, who is based at Chandlers Ford Snooker Club, then reeled off four on the bounce. Liverpool-based Deaville came back strongly to win the next three before Benzey dug deep again to clinch the decider. A prolific century breaker, Benzey has hit three figures 46 times with a highest in competition of 140. But, surprisingly, he insisted his tactical game helped him taste success in his first tournament abroad. The teenage ace said: “I thought my safety play was the best it has ever been which helped get me more chances in each frame. His proud dad added: “Good matchplay snooker along with steady scoring and great clearances under pressure helped get him over the line in what was a high-quality final in which Paul Deaville played a huge part. Benzey, who was presented with his trophy and 500 euros (£443) by former Malta professional Tony Drago, won three of his four group-stages matches. After overcoming Kieran Kay (Scotland) 3-0 in the quarter-finals, he defeated Westley Cooper (Leicester) 4-2 in the last-four. He thanked sponsors Hillcrest Structural, GH Property Management and Coopers IFA for chipping in to pay for his first tournament abroad. The week-long annual event run by Vincent Pisani on one table attracted 15 entries from Malta, England, Scotland and Wales. Organisers said it was the highest quality field they had had for at least four years and one of the best ever finals. Fellow Cuestars Under-21 Gold Tour member Bradley Cowdroy made a group stage exit. This is the event that Mark Lloyd won in 2016.